This post is a reply on a post from YML, with whom I have been working in the past. 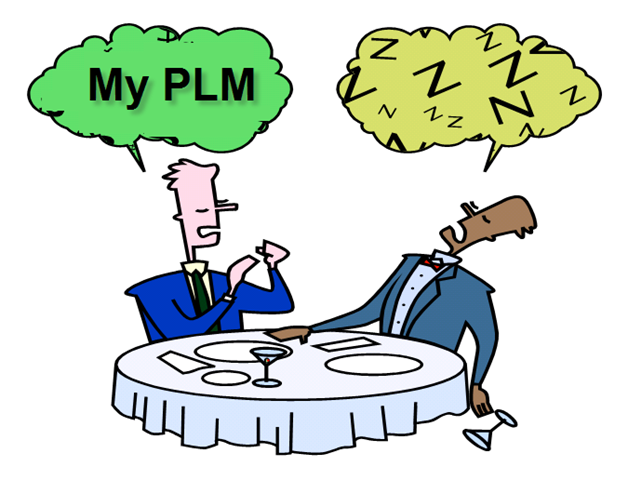 At that time we had interesting discussions on various topics around PLM and I am happy to continue this discussion in blog space. Please read his post in order to understand the full reasoning below. First I want to make a statement to avoid misconception. I am a PLM evangelist and perhaps my definition of PLM is wider than what PLM vendors currently offer. For me PLM focuses not only on storing and managing the product data (PDM), but also on the whole process of how new products or improved products are created, designed, produced and supported. From the Dassault Systemes and Autodesk (read Jim Brown’s comments on them) perspective, there is a lot of focus on the collaboration around the virtual product, however for me personally, when working with mid-market customers, I am mainly focusing on capturing design knowledge and IP plus creating visibility of knowledge inside a company, without being dependent on knowledge stored in people brains. Interesting development in that area I am observing recently is in www.vuuch.com. An initiative to empower design discussions. However I disagree with the statement that you use as foundation : Software vendor are proposing excellent product with a good ROI and SMB customer don’t understand it because they do not have a vision. I must say: read my statement above – there is still work to be done. When I am talking about the lack of vision in the mid-market companies, I will provide an update based on some experiences I had the past few weeks, where lack of vision is blocking process improvements. Next Yann is mentioning all the propriety formats of all vendors, PLM vendors, vendors of authoring tools (CAD, Content,…) and even limited version support. Yann makes a point for open-source solutions, which are part of the WEB 2.0 evolution. Interesting to see that at the same time Kurt Chen writes an interesting post on What Can PLM Offer for SMBs? in the same context. My main comment on this topic is that I understand the beauty of open source, however I also believe that if you want to work with open source solutions, you need to have a 100 % clear concept of what the product should do (that is why Linux is successful – I believe PLM is not there yet) or you need companies that have strong IT-knowledge/support to adapt the software to their needs.However, this contradicts the fact that mid-market companies usually do not have these resources to invest in this kind of activity. So what would they do ? Hire consultancy firms or software companies (sometimes the original developer of the open source software) to adapt the software to their needs. This creates almost the same dependency as what customers would have with traditional PLM vendors – they rely on their software provider as the resource to drive PLM. Who would I trust to assist my mid-market company to evolve towards PLM ? Sorry Jos but tonight Post : http://yml-blog.blogspot.com/2008/12/social-product-development-network.html was an answer to Oleg’s question. PLM for smaller companies: Oxymoron or Another Round?